If not for Atomic Robo, it would have been an all-DC week for me! I’m a sucker for stories featuring the original Justice Society members, so despite the goofy logo (which looks like the early-80s Legion of Super-Heroes logo) and the wacky perspective on Doctor Fate on that cover, I picked up DC Universe: Legacies #1 anyway. Writer Len Wein has been writing comics since the late 1960s, but he’s never really been associated with the JSA before, and honestly though he’s done some noteworthy work (he co-created the Swamp Thing and the “new” X-Men, for instance), his actual stories have never rocked my world. So I expected a decent enough story but nothing that I’d rave about. The first story in this issue met those expectations, being a somewhat contrived story about a pair of boys working for various crooks in the late 30s, one of whom wants to get deeper into the criminal life, while the other one starts to idolize the mystery men popping up around the country and has second thoughts. They have a close encounter with Sandman and The Atom (and Sandman certainly feels very weird here after reading his less athletic adventures in Sandman Mystery Theatre) which feels a little too rah-rah from heroes to kids, to me. And the issue ends with the tone of a cliffhanger as to what the kids will do, although it’s pretty clear how it will turn out. The second story, though, is much better: It involves a reporter looking into escapades of Doctor Fate and the Spectre around the same time, and being deeply skeptical of mystical heroes doing the impossible, and even uncovers evidence of fraud in their exploits. As a window on how the average man might have thought of genuine superpowered heroes when they first emerged, it’s actually quite clever and to the point. As a whole the first issue of Legacies doesn’t equal the better “man-in-the-street” superhero comics like those by Kurt Busiek, and I don’t really know why it’s called “Legacies” from this issue (it just seems like an excuse to tell some period stories with the JSA), but overall it’s a solid first issue, with good art by the Kuberts and by J.G. Jones. With a 10 issue run, I’ll probably stick around for the whole thing. 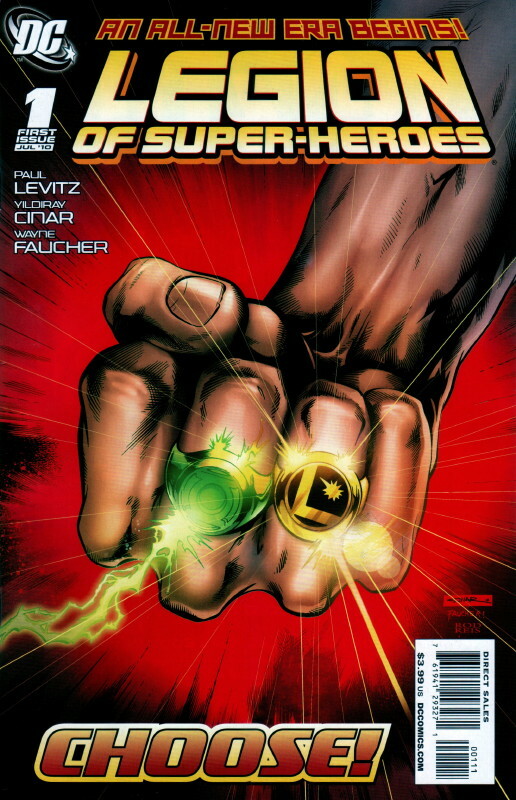 Perhaps the most beloved era of the long-running series Legion of Super-Heroes was Paul Levitz’ run – mostly with Keith Giffen and Greg LaRocque – in the 1980s. Compared to the Legion stories of the 60s and 70s – some of which were written by Levitz in his first go-round on the title – it was pretty weak and depressing stuff. Now, after two reboots, the original Legion is back (thanks to Geoff Johns’ story “Superman and the Legion of Super-Heroes”) and in their own series, with Levitz returning for his third run, having recently stepped down from being President and Publisher of DC. A good thing? One interesting twist is that it appears the events of the series after Levitz’ second run have been retconned to not have happened. 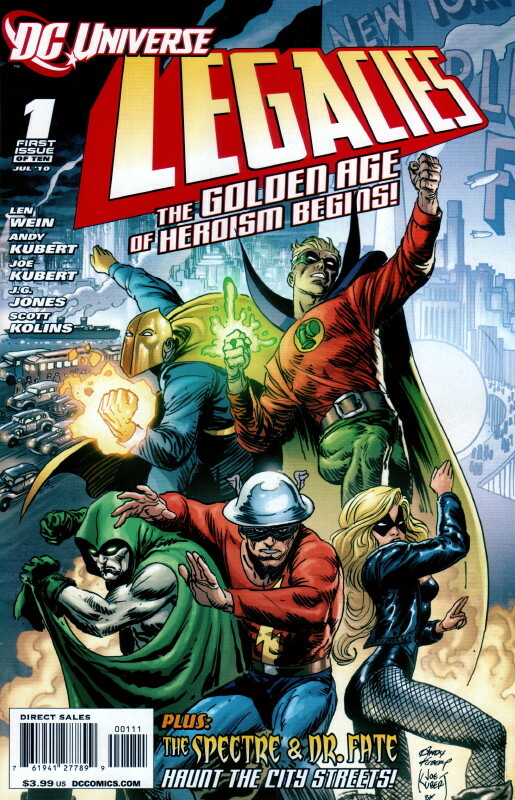 Levitz writes a text piece at the end of this first issue where he explains that out understanding of the Legion’s era is constantly changing and some stories told in the past may have been inaccurate, or not have happened. It’s not only unusual, it’s a tacit admission by DC that the reboots of the last 20 years have been failures of approach as well as of substance, that they never captured the essence of what was once one of DC’s most popular titles. But then, DC’s been on a big retro kick lately, so going back to the 80s characters and their 80s writer fits right in. But is the story any good? Well, sort of. Earth is trying to rejoin the United Planets, and the Legion is trying to reestablish itself on Earth in the wake of the xenophobia fostered by Earth-Man and his gang of psychopaths in the aforementioned Superman story. The issue opens with Earth-Man being drained of his powers, but then we learn that Earthgov is going to require that Earth-Man become a Legionnaire if the Legion is going to stay on Earth. Meanwhile, Saturn Girl visits her homeworld of Titan (yes, the moon of Saturn), where the Time Institute has also established itself, but some of their researchers commit the inevitable crime of viewing the dawn of the universe, which results in the destruction of Titan, despite the Legion’s best effort. Saturn Girl takes one of the last time spheres to find her missing twin sons. And lastly, Earth-Man is confronted with a mysterious entity from Oa and offered membership in the Green Lantern Corps. There’s a lot of stuff here, and some of it is interesting, while some of it feels gratuitious (the destruction of Titan feels pointlessly sadistic, much as the destruction of Vulcan did in J.J. Abrams’ Star Trek film) or nonsensical (Earth-Man’s recent history includes throwing aliens into concentration camps, which makes Earthgov forcing him on the Legion seem downright sick and completely implausible unless Levitz is going to show Earthgov to be completely corrupt). Not to mention that the Time Institute researchers really should have known better than to view the dawn of time, given the chaos that act has caused in the past. So the story is shaky, with character motivations that are frustrating at best. Not the best start. The high point of the issue if Yildiray Cinar’s artwork (and, secondarily, his name!). While some of his panels are strangely simplistic in their renderings, others are compelling in their composition and detail, especially the ones involving Brainiac 5. His approach is a little rough, but he shows a lot of promise. Writing the Legion has always been a tall order due to the size of its cast, its futuristic setting, and its tenuous link to the rest of the DC Universe. Unfortunately Levitz’ approach to the series has always felt to me like it robbed the Legion of their inherent fun and sense of scope, and this first issue doesn’t make me optimistic that the new series will be an improvement. I’m sure I’m in the minority among Legion fans, though, as I think this series does feel very much like Levitz’ last run on the title. Strange that after 20 years it feels like there’s so little difference, but then, Levitz hasn’t done a whole lot of writing (on the Legion or any other title) in that span, so perhaps that’s not very surprising. It is disappointing, though. I’d much rather have the fun Legion of the 60s and 70s back. But I guess the reboots tried to do that and they weren’t very successful, either. But was that because they weren’t very good, or because they didn’t feel like the real Legion? I’ve been a lukewarm towards Paul Dini’s comics in the past, but Zatanna – which debuts this week – is quite fun, if a bit brutal, as it involves evil wizards killing a group of mobsters in some particularly brutal ways. But it also sets up Zatanna as a sort of consulting detective to law enforcement where magic is concerned, and something of an enforcer to keep the evil wizards in line. 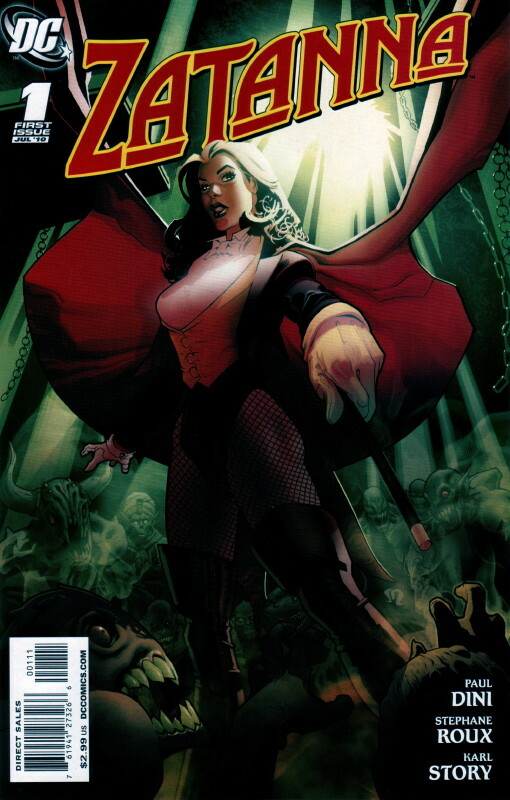 Zee’s been portrayed in the past as a more above-board counterpart to John Constantine, so that role suits her. She feels maybe just a tad too mysterious here compared to her past portrayals, but one could argue that she’s also just grown up some more since her days with the JLA and Constantine. It’s a promising start to the series. Stephane Roux’s art is excellent, ably supporting Dini’s story. His work is a little reminiscent of Alan Davis’ and even more so of Ryan Sook’s (perhaps not a coincidence, since Sook drew the Zatanna series in Seven Soldiers). I hope he sticks around for a while. Previous Previous post: What’s With This Weather?